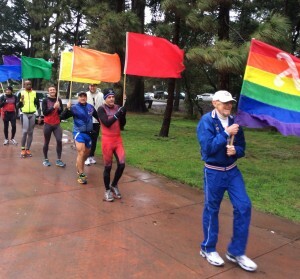 As posted earlier in social media websites, members of San Francisco Track and Field Club braved the stormy weather to support the Rainbow Run coordinated by San Francisco Frontrunners. We met at Stow Lake in Golden Gate Park and ran to the Kezar Stadium with a brief stop at AIDS Memorial for a moment of silence. The rainbow flag was carried and followed by six flags of each rainbow color to Kezar Stadium. At Kezar stadium, we were greeted by Brent Earle of the American Run for the end of AIDS (AREA) and representative from Federation of Gay Games and Team San Francisco. 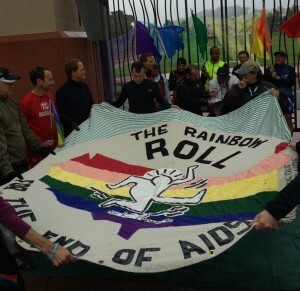 After Brent’s passionate speech about history of Gay Games, the AIDS quilt was unrolled and Gay Games Anthem was sung. Supervisor Scott Wiener also spoke about and acknowledged our involvement in LGBT community in the Bay Area and support for LGBT equality in Russia and other parts of the world. While we were shivering in the cold with rather intimate showing from our club and Frontrunners, we felt that we contributed to Gay Games and made a mark in our history. Because of the unfavorable weather, unfortunately, the Kezar track was closed. But that did not keep us from sticking with the tradition of Rainbow Run: We marched with flags waving proudly in the wind. Gay Games opens six months from tomorrow. We are working hard and physically getting ready for the competition. Emotionally, we are ready for the celebration. See you tomorrow at the team practice. Rain or shine!